An exciting revisit of Elvis' work, If I Can Dream focuses on the iconic artist's unmistakable voice, emphasizing the pure power of The King of Rock and Roll. 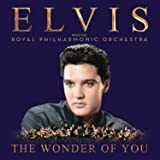 This remarkable new album features classic Elvis vocal performances with brand-new orchestral accompaniment, along with a duet with Michael Bublé, and appearances by Il Volo and Duane Eddy. Recorded at Abbey Road Studios in London with acclaimed producers Don Reedman and Nick Patrick, the 14-track album features Elvis' most dramatic original performances augmented with lush new arrangements by The Royal Philharmonic Orchestra. "This would be a dream come true for Elvis," Priscilla Presley says of the project. Few projects are able to capture the energy and essence of the music of Elvis Presley. Words are inadequate when trying to describe the emotional experience this album provides. The orchestrations are a rich and powerful addition to songs which no one ever thought could be improved upon. 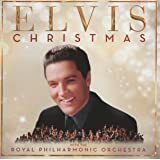 If you only ever buy one Elvis CD this is it. In this project we discover something many Elvis fans long suspected: Elvis lives. Perhaps not in body, but in spirit and soul. Long live The King. 5.0 out of 5 starsThey finally got it right!!! They finally got it right. Most attempts at doing something new with Elvis' music have failed miserably, but not this time. The beautiful new arrangements compliment his powerful voice, and actually improve upon the original arrangements rather than destroy them. And... They got the song choices right. They picked songs that may not have been as widely known as some others, but are some of Elvis' best performances. Bravo on this collection. As a lifelong fan, I was expecting another failed repackaging attempt, but was more than pleased at the outcome here. The orchestration is beautiful, and makes this a listening treasure. Thank you. You have made songs that I have listened to thousands of times seem new, and in a really, really good way. Now, please, a volume 2 done with as much care and true production, will gladly be received! Wow! Awesome arrangements. Breathes new life into even the old tired songs you've heard a million times before. Less bombastic and/or maudlin (depending on the song) than the originals. Elvis' voice really takes center stage. Well done! I never thought I would buy an Elvis album at this late date. Glad I did. 5.0 out of 5 starsA BRAND NEW SOUND FOR ELVIS!!! I believe I have just listened to the most nearly perfect album/cd in the history of the recording industry. Of course, because of my love of Elvis Presley music, I maybe a little biased. I received in the mail my copy of the newest Elvis Presley compilation. 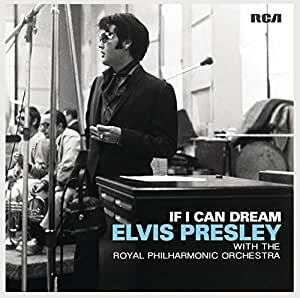 The cd is titled "If I Can Dream - Elvis Presley with the Royal Philharmonic Orchestra". the emotional readings, by Elvis, of those recording. No changes to those original notes, just the new backing arrangements of the Royal Philharmonic Orchestra. Magical, beautiful, fuller, richer. 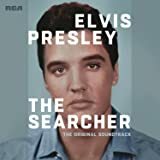 This is a fantastic, creative album that shows off the true range of the talent that was pure Elvis Presley. I have no doubt, none at all, that Elvis would have been proud this album. He would have loved it.